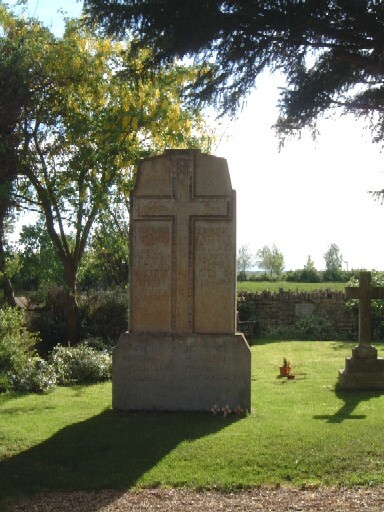 The war memorial stands in the churchyard of All Saints Church. Private 3469, (CWGC gives 2/1st) 1/1st Buckinghamshire Battalion, Oxfordshire & Buckinghamshire Light Infantry. Died of wounds Tuesday 25th July 1916 in France & Flanders. Enlisted Aylesbury, resident Bletchley. Buried in ETAPLES MILITARY CEMETERY, Pas de Calais, France. Grave XIV. E. 6A. Private 20674, 4th Battalion, Bedfordshire Regiment. Died of wounds Friday 6th July 1917 in France & Flanders. Age 24. Born Sherington, Bucks, enlisted Ampthill, resident Milton Keynes. Son of Lizzie Savage (formerly Butcher), of Milton Keynes, Newport Pagnell, Bucks, and the late Thomas Butcher. Buried in AUBIGNY COMMUNAL CEMETERY EXTENSION, Pas de Calais, France. Grave III. E. 11. Private 8144, 2nd Battalion, Oxfordshire & Buckinghamshire Light Infantry. Killed in action Monday 17th May 1915 in France & Flanders. Age 22. Born Milton Keynes, enlisted Wolverton, resident Newport Pagnell. Son of Joseph and Caroline Clare, of Milton Keynes, Newport Pagnell, Bucks. Commemorated on LE TOURET MEMORIAL, Pas de Calais, France. Panel 26. Son of John Dover of Milton Keynes, Newport Pagnell, by his wife Blanche, dau of the late Charles Newton. Born Milton Keynes, Newport Pagnell, co Bucks, 13th Dec, 1896; educated Elston School, Bedford; was a signalman; joined the Royal Bucks Hussars 21st Sept 1914, served with The Egyptian Expeditionary Force in Egypt and Palestine from the 1st Sept, 1915 and died at Beersheba 10th Nov 1917, from wounds received in action near Ascalon. Buried in the Military cemetery, Beersheba. Unm. Lance Corporal 20675, 4th Battalion, Bedfordshire Regiment. Killed in action Saturday 9th November 1918 in France & Flanders. Age 22. Born and resident Milton Keynes, enlisted Ampthill. Son of George and Jane Markham, of The Green, Milton Keynes, Newport Pagnell, Bucks. Buried in BOUGNIES COMMUNAL CEMETERY, Quevy, Hainaut, Belgium. Private 18574, 2nd Battalion, Hampshire Regiment. Killed in action Saturday 30th October 1915 in France & Flanders. Age 19. Born Newton Longville, Bucks, enlisted Bletchley. Son of James and Jane Ann Sear, of Milton Keynes, Newport Pagnell, Bucks. Formerly 8298, Oxfordshire & Buckinghamshire Light Infantry. Buried in AZMAK CEMETERY, SUVLA, Turkey. Grave II. B. 9. Private 206216, Royal Buckinghamshire Hussars. Died of wounds Monday 11th June 1917 in Egypt. Age 22. Born and enlisted Buckingham, resident Newport Pagnell. Son of Thomas and Kate Waite, of Milton Keynes, Newport Pagnell, Bucks. Buried in CAIRO WAR MEMORIAL CEMETERY, Egypt. Grave F. 259.